Is a Fire Cooking in your Phoenix Kitchen? Don't DIY smoke and soot damage. Cal SERVPRO for professional remediation. No one wants to be reminded of that time there was a fire in their kitchen; every single time they enter the room. Fire damage can come in many forms, and unless professionally remediated, unpleasant scents can remain in the home. Fire odor removal in a Phoenix home affected by a small fire in the kitchen is frequently a problem homeowners have attempted to cover up on their own. A forgotten pan on the stove or turkey in the oven may not have left much in the way of visible residues, but a lot in the way of stubborn odors. That is because when proteins such as meat or eggs burn, the fats turn into a fine mist, bonding with the soot particles and penetrating porous surfaces. Regular household cleaners do not penetrate deeply enough into the surfaces to reach the odor-causing particles and the longer they remain, the more embedded the odor becomes with the possibility of spreading to other areas. SERVPRO technicians are certified in Odor Control and use a multi-layered approach for protein-based odors. Our professionally formulated cleaners are designed to penetrate deeply into surfaces. 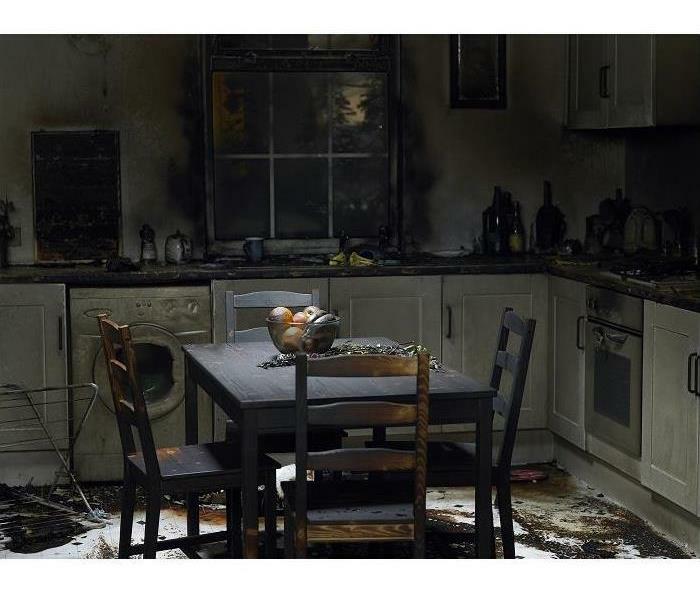 Our technicians use both wet and dry sponge methods to ensure that all affected areas of fire damage in the kitchen are addressed. The HVAC duct system is also inspected to determine if the odor was pulled through the ducts and they are cleaned if necessary and suggest a new filter installed. When more robust methods of odor control are required to eliminate lingering protein odors, SERVPRO technicians may contain the kitchen using poly-barriers and set up air scrubbers fitted with HEPA filters to capture motes so tiny they cannot be seen with the naked eye. Heat removal of odors through fogging is another effective way to neutralize odors we use. A solvent is heated and spread over the area in a fog form, overtaking and changing odors at the molecular level. SERVPRO of Phoenix is ready to help you remove fire odor in your home with our professional equipment and expertise. Call (480) 503-2090 for 24/7 and talk to one of our knowledgeable staff right now. Click here for information about Phoenix city parks. When water loss incidents threaten your Phoenix home, getting the right professional assistance responding quickly to the disaster is critical to protecting both your property and its contents. Effective solutions for removing standing water and drying out saturated elements is only the beginning to fully recovering your property exposed to higher volumes of spreading water. Our team has a 24/7 response to these emergencies, arriving with the full measure of our recovery equipment and experienced technicians to begin effective mitigation tactics right away. There are many steps to water loss recovery in your Phoenix home, but water removal is among the priorities for technicians responding to the emergency. Standing water can pose significant risks to exposed materials including flooring, walls, and ceiling spaces. Without adequate removal and drying techniques to follow, you can find this water damage continuing to spread throughout your home and degrading construction materials, weakening structural elements, and facilitating the growth of hazardous secondary effects like mold. While standing water might be difficult to see in your home, our SERVPRO of Phoenix professionals have a broad inventory of recovery equipment designed to reduce this threat quickly. You can count on our IICRC-certified professionals to respond 24/7 to this water loss emergency and make it “Like it never even happened. Give us a call today at (480) 503-2090. Click here for more information about the city of Phoenix. When you discover a leaky pipe call us right away we are available 24/7 so we can arrive at a time that is convenient for you. Water damage is most often caused by leaky piping, damaged water lines, or a burst pipe. No matter the cause of the water damage in your home, it is essential for you to reach out for help as soon as you possibly can. Leaving water damage unchecked is never a good idea; in fact, it tends to lead to even more damage forming inside of your home. 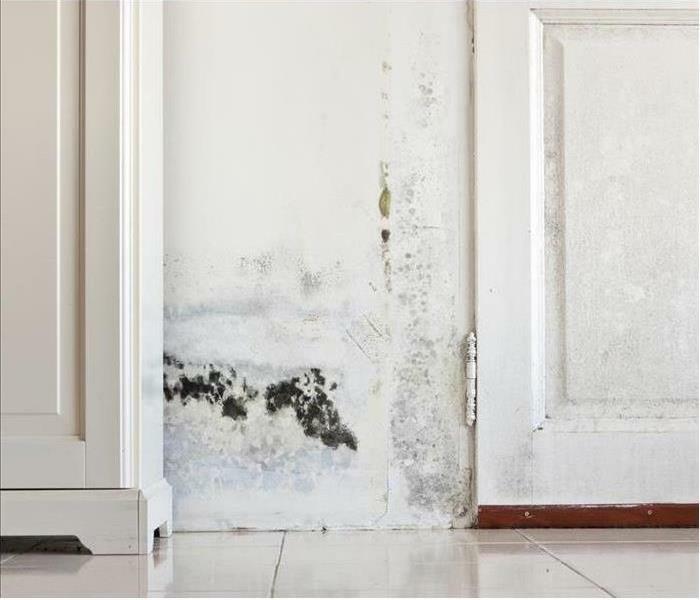 As excess moisture sits in your home, it can cause mold damage, as omnipresent mold spores can feed off of the sudden increase in water. The water damage, inside your Phoenix home, was caused by a leak under your kitchen sink. Because of the cupboards hiding the evidence, the leak went unnoticed for a few days before you began to notice water draining out from under the toe kicks. The leak was easy enough to fix, but the damage to your cupboards was visible. Water damage often causes wooden surfaces to bubble, swell, or even crack. When you call SERVPRO, we make a habit out of arriving at your home as soon as we are able. We always aim to arrive within hours of your initial call, as we understand how essential it is to deal with water damage as soon as possible. Once we arrive, our excellently trained IICRC-certified SERVPRO technicians can do a brief investigation and then begin the remediation process. SERVPRO can begin by removing the toe kicks from directly under the cabinet and feeding an air-blasting tube underneath. Hitting both sides of the wood helps to ensure the best chance of thoroughly removing the moisture. We can use dehumidifiers and ventilation fans to supply a constant stream of fresh and dry air, encouraging evaporation. Once done, we can use moisture meters to ensure that the levels are within an appropriate range. As a final touch, SERVPRO can use an antifungal agent to kill any mold colonies that may be forming, but cannot be seen by the naked eye yet. When sudden water damage impacts your home, never wait to get help. Dial (480) 503-2090 to get in contact with SERVPRO of Phoenix. Day or night, 24/7, we're constantly available to help you. Visit the Horse Lovers Park and let your children play, learn, compete and grow click here for more information. Mold growth is a frustrating problem to deal with in Phoenix homes because of the effect it can have on your property and family. It can cause damage to walls and floors, leading to unpleasant odors, and even have health implications on your household. If you suspect the presence of mold damage in your Phoenix property, contact SERVPRO as soon as possible. We are a trusted company in the restoration industry, and our technicians are up to par with IICRC guidelines to ensure a seamless mold remediation process. We also have high tech cleaning equipment that is available on demand, all in our dedication to restoring your home to standard conditions as fast as possible. To eliminate mold damage in the house, you first need to understand where mold is most likely to develop unnoticeably. Window sills are especially prone to mold growth because they provide ideal conditions for its survival. Window sills allow condensation to build up throughout the year and unless the windows are open, there is not sufficient air circulation for evaporation to occur. Dirt accumulates on the sills and window tracks, providing food for the mold. It is advisable to wipe out this condensation and clean out the dirt on a regular basis. Refrigerator drip pans are also good places to look for mold damage. All refrigerators come with drip pans that collect condensation along with food particles and spills. This combination of food and moisture in an area with poor air circulation provides a conducive environment for mold growth. If the mold growth is excessive, SERVPRO technicians can come in and clean it up using special antimicrobial products. Mold damage can also develop inconspicuously behind wallpaper. Mold and mildew feed on cellulose, which is commonly found in drywall, wallpaper, and paste. Identifying mold growth behind the wallpaper is difficult unless it is peeling off in certain areas, or you are detaching it from the wall. Removing and treating mold-damaged wallpaper should be done by trained professionals to avoid contamination with mold spores. Our mold damage remediation experts can treat the surface with high-quality adhesives and a mold-resistant primer before new wallpaper is installed. As a general rule of thumb, do not put wallpaper in places exposed to moisture such as the bathroom or kitchen. Mold growth can overtake and overwhelm your home in a matter of days. That is why SERVPRO of Phoenix is dedicated to fighting and eradicating all signs of mold damage as soon as they appear. For emergency services, call us today at (480) 503-2090. Information on this city please click here. Water damage can be tricky to control in Phoenix homes. When water finds its way into structural cavities of your home, it creates trapped pockets of saturation. Locating water in these spaces often requires using advanced moisture detection meters; otherwise, the moisture continues to wreak havoc on structural components. This dampness can result in odors at a minimum, but the more significant damage may surface when materials begin to shrink, delaminate, split, and deteriorate demanding costly repairs. If you detect excess water or moisture in your Phoenix home, you need to contact an experienced water removal service to control the damage. At SERVPRO, we have a team of highly trained, highly skilled restoration experts who can respond quickly to your water damage emergency in Phoenix. Our equipment is up to scratch with IICRC guidelines, and our methods are designed to accelerate the drying process and help you get back to your life as soon as possible. There are many different causes of flooding and water damage in the house. Some of the factors that may necessitate water removal services include clogged toilets, leaky dishwashers, broken dishwasher hoses, broken pipes, leaky roofs, overflowing washing machines, foundation cracks, and plumbing leaks. Weather-related events such as heavy rain, floods, and heavy snow can also lead to excess water in your home. SERVPRO has a wide range of tools for dealing with both major and minor water damage situations. Too much water can cause significant destruction to your property, so it is important to initiate the water removal process immediately. By starting the cleanup job sooner rather than later increases the chances of saving water-soaked carpets, furniture, clothing, rugs, and other items. Assessing the extent of the water damage is essential before choosing the water removal procedure to avoid further loss. Water damage comes in some categories. The first category refers to clean water and does not present a threat to humans. It can come from sink overflows or broken appliances, among other sources. The second category refers to gray water, and it is typically contaminated with microorganisms, putting you at risk if ingested. Possible causes include seepage, broken sump pumps, and broken toilets. The third and most severe category of water damage is known as black water. 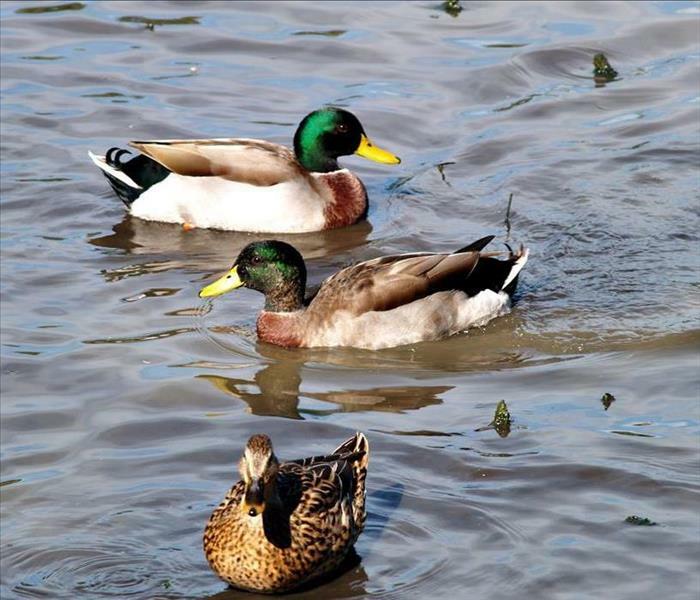 It is packed with bacteria and other disease-causing pathogens, with sewage problems being the most common source. The water removal process involves using different materials and procedures with the aim of saving cherished belongings. 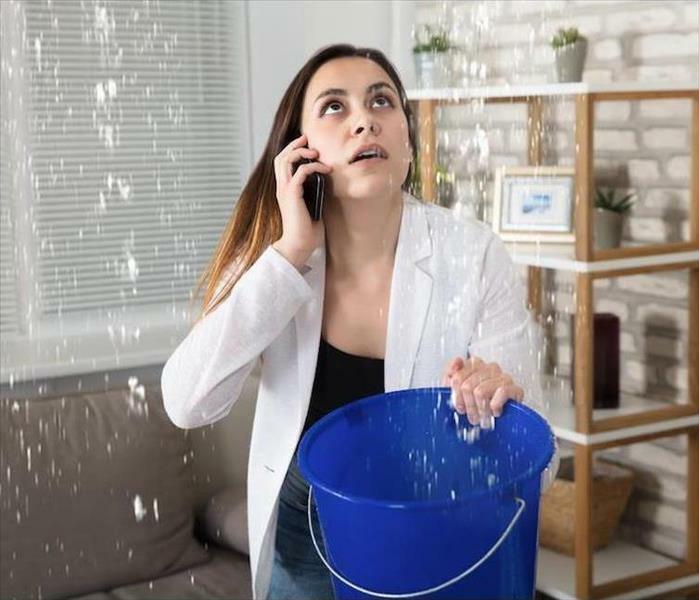 While SERVPRO specializes in mitigating water damage, our success depends on the amount of water causing the damage and the severity of the situation. If your home has sustained extensive water damage, SERVPRO of Phoenix has the tools and the means to assist. We are available around the clock and can provide swift water removal services at your request anytime. Call us today at (480) 503-2090. Learn more about this city here. At SERVPRO of Phoenix, we do everything possible to reduce the damage to your home from a fire. Phoenix homeowners deal with a problem a week; at least it feels that way sometimes. Usually, it is minor like washing chalk art off the driveway and the side of the house 10 minutes before a backyard party is supposed to begin. Sometimes, the problem is a serious one, like a fire. Even with fire damage, Phoenix homeowners face a less serious problem than at first glance. Most fires do not destroy a home or result in the need for massive reconstruction. Often, the level of damage requires extensive cleaning. With over 20 years of experience, SERVPRO has categorized the damage into three levels and designed our restoration plan around them. Minor Damage is the most common level of a fire. Here, there is no structural damage to repair or restore, and only a few walls and ceilings might need repainting. Property loss is usually smaller items like books, delicate clothing, and perhaps small appliances. Smoke and soot residue is the bulk of the cleaning issues, but it is only light to moderate. Our technicians wipe this away with dry sponges and perhaps with a mild cleaning agent. With Medium Damage, there is still little physical damage to the structure. The odors generated by smoke and soot are stronger in the walls and ceilings, which requires additional labor hours by SERVPRO technicians to deodorize the home. Smoke and soot residues are thicker and require more time and stronger cleaning agents to remove them. More and larger property is written off at this level, to include chairs, mattresses, and other furniture. The home requires extensive repainting throughout, and the finish on wood floors may need replacing. Major Damage is where we see a structural loss. It is particularly severe near the fire point of origin with the replacement of interior walls a must and often the wall framing behind them as well. If the fire burned long and hot enough, the flames reached the attic or crawlspace. When this happens, there is damage to the roof and the support structure underneath it. Smoke and soot residues cover most if not all of the house which requires more time, cleaning agents, and specialized equipment like foggers to remove the residue and the odors they leave behind as well. Personal property loss is massive at this level. At SERVPRO of Phoenix, we do everything possible to reduce the damage to your home from a fire. In addition to cleaning and restoration, our office can help you rebuild your home and work with your insurance company, for the full coverage you paid for over all those years. Call us today at (480) 503-2090 for more information or to schedule an appointment. Click here for more about the city of Phoenix. The stress of dealing with criminal activity in your home need not be exacerbated by a do it yourself cleanup. Because the substances needing disposal are often dangerous or difficult for a layperson to manage, it is best to engage a professional service. SERVPRO offers compassionate and properly trained technicians to put your home back in order. A home invasion cut mercifully short by watchful neighbors calling 911 still leaves you with crime scene cleanup at your Phoenix home. You and your family are safe but terrified. The terror feels like it may never end as your living areas were damaged first by the accused and then further disrupted by the police intervening and then completing their investigation. Our trauma and crime scene abatement team knows and follows applicable Environmental Protection Agency (EPA) and Occupational Safety and Health Administration (OSHA) regulations and rules when cleaning and restoring your house. If ever you needed SERVPRO to come through on our promise to make it “Like it never even happened,” crime scene cleanup is near the top of the list. Biohazards like blood and dangerous and irritating chemicals suddenly permeate your home, and you have neither the knowledge nor the energy to deal with their appropriate removal. Specialized training readies our crews to seek out all the debris scattered throughout your home due to the crime and the police actions and follow up. 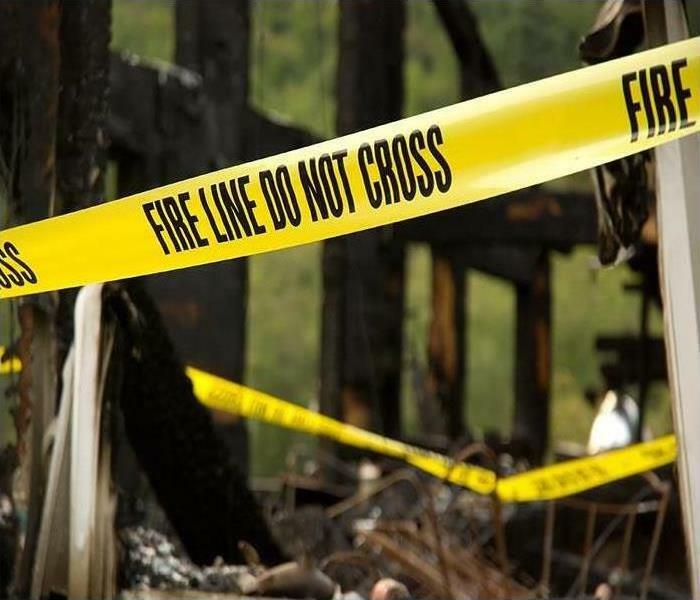 We take all precautions to manage every cleanup aspect relating to the crime and its aftermath. Knowing what you or your family endured is motivation to clear away every scrap of evidence that the unthinkable took place in your home. 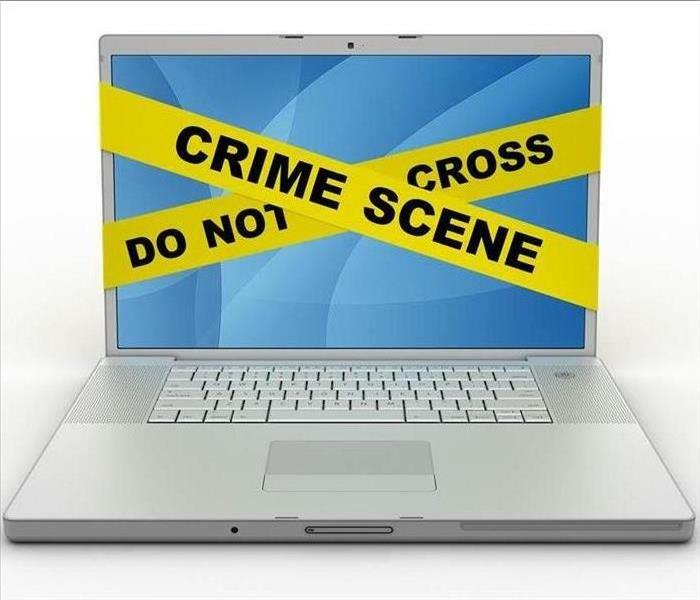 Damage from fights, debris from firearms or other weapons, bodily fluids from victims or perpetrators alike, and the whole gambit of police evidence gathering materials end up bagged and taken from your premises. Carpets cleaned, walls washed, holes filled in and touched up with paint go a long way to restoring a sense of control and peace even after disruptive or deadly force shatters your quiet enjoyment of your home. SERVPRO of Phoenix has the training, technicians, and equipment to set you and your family on the path to trauma recovery. Call us at (480) 503-2090 day or night for fast, professional help from our kind and efficient team. Enjoy the Parks of Phoenix. Floods don't stand a chance when SERVPRO of Phoenix is involved! 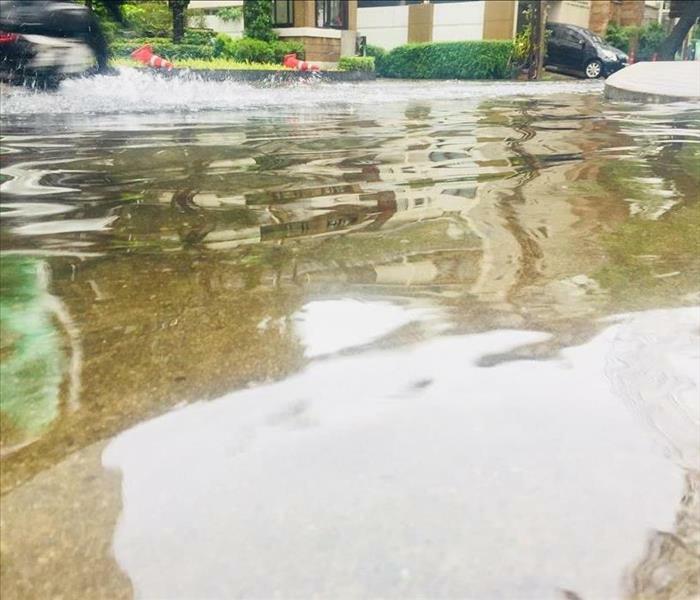 Sources that create flooding in Phoenix homes do not always require lakes and rivers, as clogged drains along streets can also cause minor incidents to happen in neighborhoods. Street cleaners attempt to prevent this, but large amounts of debris can cause overflowing to encroach lawns if water draining along the roadside pushes it into the drain's area. When your home in the Phoenix area ends up with water from the street covering your floors, you need experts who know how to perform flood removal and extraction services to make your home safe and livable again. At SERVPRO, we train using a variety of materials found in homes to ensure we know how to manage any amount of flooding that might occur. Restoring our customers' properties to their preloss condition is our goal. Extracting water faster than it can recede protects your home from the continual evaporation that standing water does inside your house. When flooding affects your home, immediate damage happens when walls become saturated. Carpets absorb not only water but also pathogens, chemicals, and organic matter. We remove these items from your home to make cleaning and drying can happen more efficiently. However, we want to remove as little as possible, as replacement items almost always cost more than restoring those same items costs. Cleaning carpets to preloss condition and dealing with crumbling drywall are two exceptions to this. Cabinets in your kitchen and bathroom can sustain short periods in the presence of water before becoming damaged and require replacement. The same is true for hardwood flooring. We need to act quickly to save these from unnecessary damage by removing the excess water. Once we do this and start to restore dryness inside your home, we can check to see how extensive the damage became on these and other items. Stairways made of wood can become warped when water invades, but drying the area can decrease any twisting to within acceptable limits. The same occurs with wood furniture, although any pieces made of particle board almost always become too swollen to remain safely in the home. Swollen areas can mean the glue that held the piece's boards together disintegrated. This can result in crumbling, which also leaves choking hazards that you want to avoid to protect any toddlers or curious pets. Call us, SERVPRO of Phoenix, at (480) 503-2090 for flood removal and extraction specialists in the Lone Mountain and Paradise Valley areas. We care about the condition of your home and want to partner with you to make the restoration process as smooth and efficient as possible. How Much Damage Can a Faucet Leak Cause Your Phoenix Home? As a Phoenix homeowner, you are all too familiar with the long list of potentially damaging occurrences that could affect your home and cost you money. 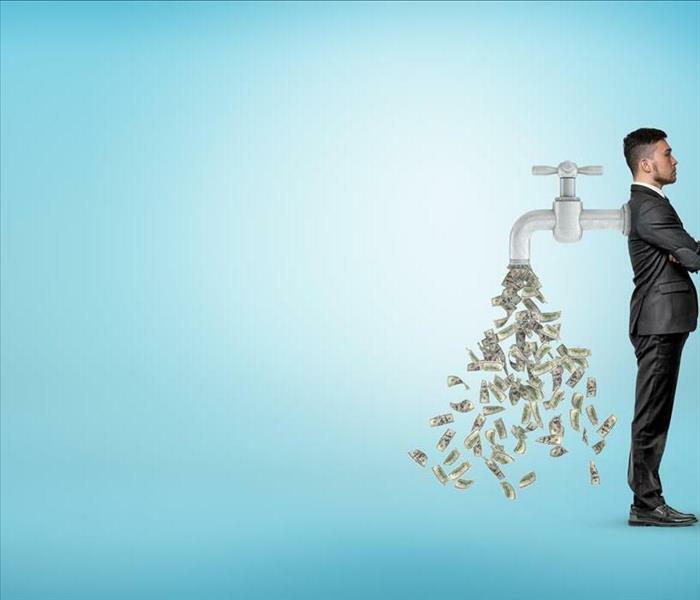 While you might work to restore and repair some of these concerns on your own as they happen, the effects of these leaks continually get worse the longer they contend with your busy schedule to get replaced or fixed. Leaking fixtures and faucets are one such problem that can be a common threat to homes if the situation does not get resolved quickly. Understanding the water damage that a leaking faucet can do to your Phoenix home begins with an appreciation of water spreading farther than your eyes can see. Often affected materials nearby might be as far as damage evaluation and assessment goes. Failure to identify the full problem ultimately allows for more significant concerns to worsen in unseen areas or deeper into the exposed materials themselves. Our SERVPRO professionals have the equipment and expertise to help. 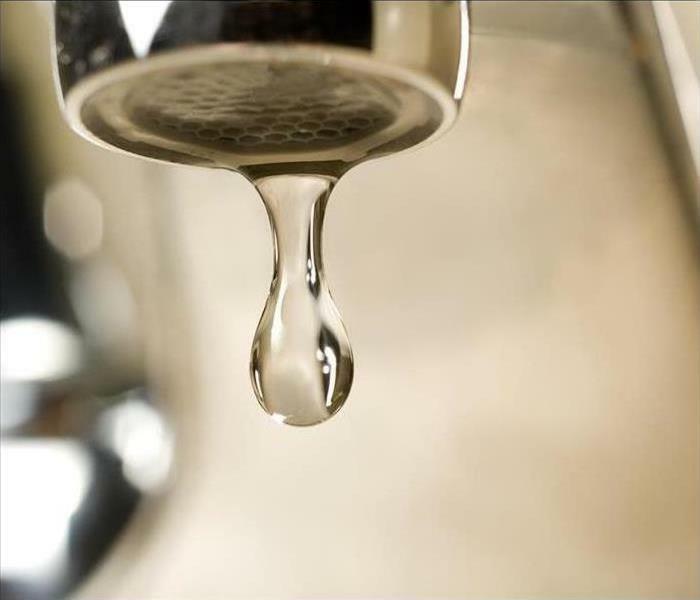 While a leaking faucet might not immediately appear to present significant water damage to the surrounding materials and areas of your home, a persistent leak can saturate cabinetry, counters, and drywall quickly to risk secondary effects like mold growth on top of structural concerns. With the right levels of saturation, drywall can become unsalvageable after only 24 hours, requiring demolition and replacement to restore this area of your home. It is vital to reach out to qualified professionals like our SERVPRO technicians immediately when you discover a water damage incident in your home. Our IICRC certified technicians arrive with moisture detection tools that can identify pockets of dampness to focus drying efforts to follow. If caught early enough, many of these exposed materials can get saved by our drying and cleaning efforts. Why throw money away? Give us some, and you keep the rest! 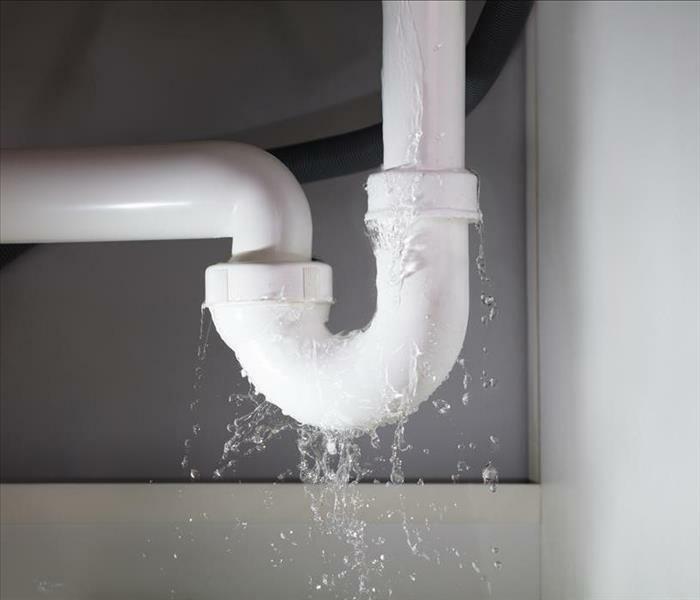 What might appear like a small leak can produce a substantial problem for your property without the appropriate cleanup and restoration. You can count on our qualified SERVPRO of Phoenix team to arrive quickly with effective mitigation and restoration tactics that can protect your investments. Give us a call anytime at (480) 503-2090. Water damage to a fast food restaurant can set you back thousands of dollars in damage restoration costs and lost revenue. However, with the help of a professional company like SERVPRO, that lost profit can be mitigated through some of the unique aspects about our service that have cultivated a national reputation for industry-leading care for service sector businesses in crisis. We focus on fast turnaround times and thorough work for all of our service sector clients to enable you to reopen doors and resume normal operations as quickly as possible and prevent days of lost revenue from racking up. Sending out crews equipped to handle the specific water damage problem your Phoenix fast-food restaurant faces can be a challenge for inexperienced companies. Different situations require different types and amounts of crews and equipment, but with a wide variety of both certified damage mitigation specialists and high-quality machinery, we can help with any size disaster without also employing too many countermeasures for what could end up being a minor issue. SERVPRO inspectors have years of experience that help them to understand how to make sure our crews do their work thoroughly and completely without letting expenses skyrocket out of control. We work fast to make sure doors reopen as soon as possible after a flood or spill in your establishment. Having worked with businesses for decades and learning their main concerns after a significant damaging event, we have adapted our approach to commercial water damage mitigation and cleanup projects to use only the fastest and most effective approaches possible. Depending on the size of the incident, doors may not ever close, and we can sometimes do our best to solve the problem while keeping the place open and in business. We can also provide after-hours cleanup if this further protects your enterprise. SERVPRO of Phoenix provides the fast and well-trained water damage mitigation services necessary to keep your business up and running during and after a flood or spill. Call us at (480) 503-2090 for our services or a quote. 4/9/2019 - Is a Fire Cooking in your Phoenix Kitchen?